Registered Art Therapist Straja Linder King offers traditional psychotherapy in conjunction with art/animal-assisted therapy, to individuals and groups of all ages on a per hour basis. Services are provided in Straja's private studio (in St. Stephen's Anglican Church, 1121 - 14 Ave. SW Calgary), or on-site at your location (in educational, correctional, residential, rehabilitative, palliative and hospital settings). Please contact Straja directly with any questions or to book an appointment. Straja accepts payment in cash or cheque (made payable to Straja Linder King). Meet the New Therapy Dog Team! Tala Rain is on the left. 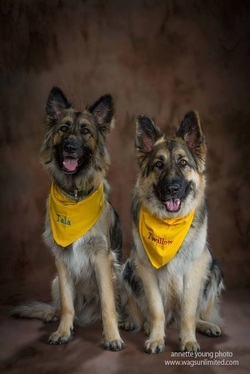 She is the half sister to Tumbra, the remarkable therapy dog who learned how to read. Twillow Rose is on the right, she is the granddaughter to Alberta hero dog Tangus.